Every now and again a report comes out that turns me into a nodding dog. They tend to be the ones that confirm my experiences or more honestly my biases. Add to that a Department for Educations consultation that feels in part confused and you have some great material for a blog post. One of the latest Department for Education consultations is on the issue of coasting schools. Intervening in failing, underperforming or coasting schools is a good idea. We need to offer the best education we can for our children and young people. A process which ensures we continually do a little bit or where necessary a lot better I don’t have a problem with. As ever the devil is in the detail; is it acceptable to have two different, unconnected accountability systems which conclude that we have outstanding coasting schools? The passage above reads like a statement by leaders, at the end of a summit, who can’t actually agree on very much. Regional School Commissioners are also likely to start sending warning letters and notices in what may become a paper tsunami if we don’t stop and think the whole thing through. There are far too many people judging, throwing stones and condemning with no responsibility, involvement or accountability for improving the education received by a single child or young person. In austere times there are a luxury. At all times they are a liability. Get ready for a bit of confusion and chaos in the years ahead as the DfE, Regional School Commissioners and Ofsted pursue different agendas. The heading is taken from the Education DataLab and FFT Aspire (2015) Floors, Tables and Coaster: Shifting the Education Furniture in England’s Secondary Schools; brilliant and thought provoking in equal measure. It’s worth taking the time to read and also follow the author Dr Rebecca Allen on twitter. The heading should become the touchstone or mantra of anyone seeking to change the accountability system. The report suggests accountability measures should be amended so a pupil’s outcomes are proportioned by the time spent at the various schools s/he has attended, termed “weighted” in the report. Kicking a child out at the end of Year 5 or 10 in the expectation s/he won’t be on your results is removed as an incentive. Being socially exclusive, as a school, would no longer be rewarded. For many schools there is little difference but for some outcome measures change by as much as 5%. We need to be clear about the fairness of any accountability measures we use and eliminate perverse incentives and this seems a sensible first step. 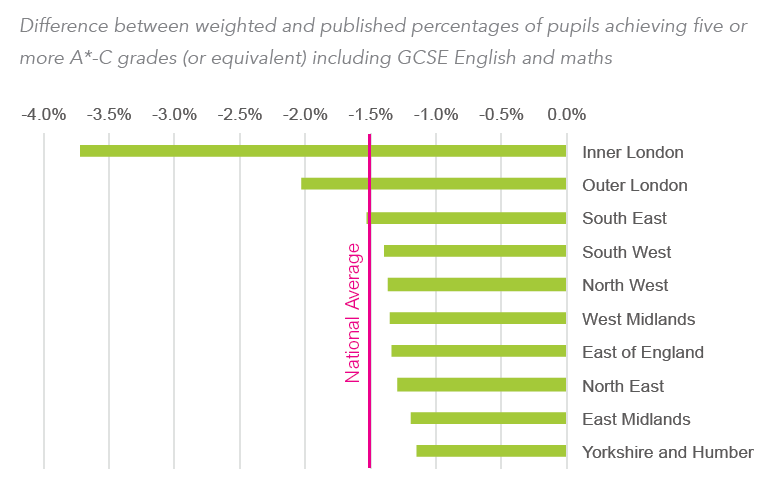 The increase in the numbers taking English literature, and subjects that fill the three open Progress 8 slots, has come mostly from lower-attaining pupils. The increase in those taking two sciences, and subjects that fill the three Progress 8 slots reserved for EBacc subjects, has come mostly from middle ability students. The increase in those taking languages and humanity subjects, meanwhile, has come predominantly from those with above-average prior attainment. “Overall, there is certainly no evidence here that Ofsted judgements reflect schools on the cusp of change.” The conclusion in the Education DataLab and FFT Aspire (2015) document does seem to contrast with the DfE consultation suggesting that Ofsted may be able to spot “where data does not yet reflect a school’s rapid improvement”. In terms of Ofsted’s judgements across a range of schools, whose performance deteriorated or improved, they were either too optimistic or pessimistic; you really are in toss a coin territory. Understandably Ofsted needs to triangulate its judgements. You end up either going back to the data or accepting an idiosyncratic set of judgements will be made, sometimes right but too often wrong. Whilst I accept I have a propensity for negativity where Ofsted is concerned that is not my intention here; they really are between a rock and a hard place. When Ofsted was first formed publically available data was limited. Now it abounds and it is increasingly exposing the unreliability of Ofsted’s judgements to the point where a court case suing the inspectorate can’t be too far away. Too much injustice has occurred over time. We’ve probably reached the point where there have been so many additions to the accountability system that the whole thing has become a carbuncled monster. Ofsted need a new role, we no longer require a universal inspection system and safeguarding needs to be detached and become part of an annual audit type approach with external scrutiny. A rethink about metrics is long overdue based on progress. Straight attainment measures, like above 60%, provide an additional safety net for those schools who are already significantly advantaged in terms of their intake. Alternatively, use attainment but place schools in bands (deciles) of similar schools determined by the percentage of pupils from disadvantaged backgrounds. As a leader or teacher you now have an equal chance of being successful and seen as effective irrespective of the level of disadvantaged pupils within the school. More than ever we need a coherent, effective and just accountability system. This might be a fairer approach to judging schools. Context is key.